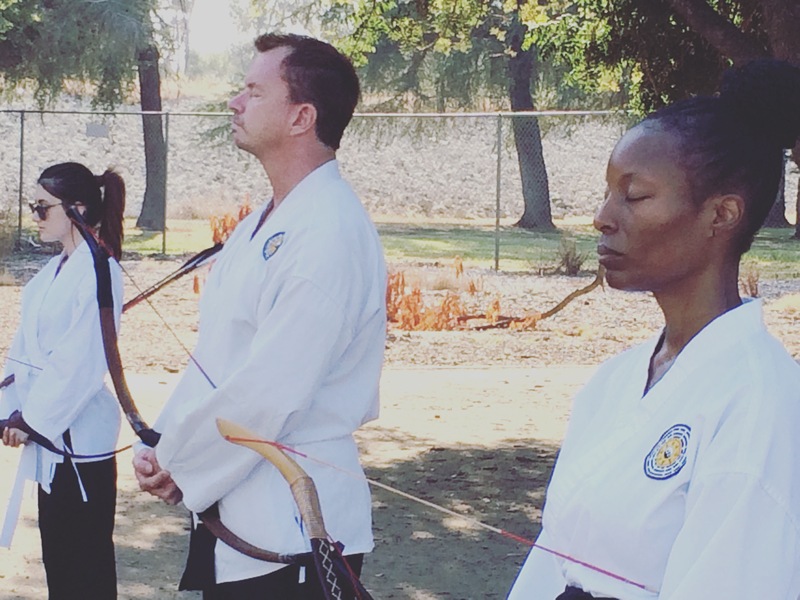 Archery is the discipline that first drew me to World Pa Kua Martial Arts and Health in late 2015. 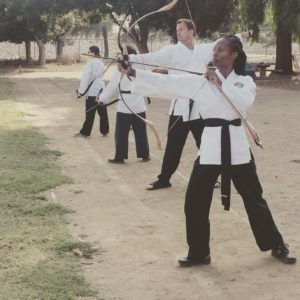 I had moved near the North Hollywood studio, saw a banner advertising archery, took a class, and was hooked. 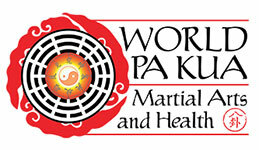 I appreciate that Pa Kua uses traditional and ancient Chinese materials and techniques. We do not use modern, hi-tech materials or gadgets like scopes and tripods. Instead, we use wooden “recurved” bows and wooden arrows fletched with feathers. They are all made by hand. We practice either indoors at the studio with padded targets or outside at a local archery range, at distances of up to 100 meters. Our goal is not to compete with another, much less to hunt, or do any kind of of violence. It’s more an art than a sport. The spirit and atmosphere is meditative. 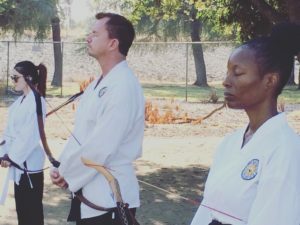 We view everything from the moment we step on the mat or on the range — from stringing the bow to de-stringing it at the end — to be rituals that we perform with intent and purpose, with grace and dignity. We bow to begin and to end the class, just as in all the other Pa Kua disciplines. In short, at the World Pa Kua school, we use archery as a means to develop our inner selves. Sure, it’s fun to learn a variety of physical techniques. Over time, we learn a host of ways to shoot the arrows: Standing, taking steps with either leg, on the knee, sitting, lying down, turning 180 degrees, hiding behind obstacles, walking in lines or circles, in tandem with other archers. We shoot at increasing distances. We shoot while holding multiple arrows in one or both hands. We learn to shoot right-handed and left-handed. And more. No doubt, it’s fun to become more accurate, more consistent, and more capable with more difficult techniques. But at its heart, archery for us is a spiritual discipline. By practicing archery, we learn and live out spiritual principles that we can then take into the rest of our lives. Quieting the Mind. We do our best to release distractions and mind “chatter.” Not surprisingly, the busier and more preoccupied our minds are, the harder it is to shoot an arrow well. Being Present. Similarly, we learn to be present in the moment. We can’t be thinking about the conversation we had earlier in the day or what we’re eating later for lunch. We can’t be worried even about the last set of arrows. We have to focus on this moment, and do our best with this arrow. Attention to Detail. The little things matter a lot in archery. How we stand, how we follow through, how we point our fingers, what angle we hold the bow at, how firm our wrist is at the bow, how we breathe. When we pay attention to details, we get better results. Preparing … then Letting Go. We learn to prepare well. We learn techniques and we practice them. We quite literally take our best shot. But then, we have to surrender the results. We release the arrow, letting it fly, and letting go of the actual outcome. Maybe the wind comes up if we’re outside. Maybe we accidentally trip or lose our balance. With each arrow, we learn that some things in life we can’t control. Non-Reactivity. We learn a demeanor that is calm, serene, quiet, and non-reactive. If we react to individual arrows, we are more likely to be “off” in subsequent arrows. If we react to something outside the shooting area — a stray thought or preoccupying emotion or something in our environment — our shooting is more likely to be “off” in general. These are just a few examples of the lessons that we learn through the practice of archery.  Sometimes, as part of the class, we will include meditations or specific rituals (formal, stylized sequences). These practices underscore the spiritual principles that we learn. 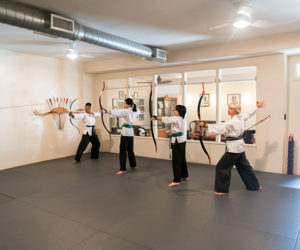 Of course, because it is a “martial” class using real weapons, we will sometimes incorporate in class other defensive elements, such as learning to do falls and rolls and kicks, for example. And as the classes begin, we stretch and warm up, to prepare the body for the practice. 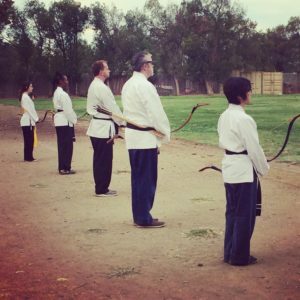 But the majority of our classes involve learning to shoot arrows using a variety of techniques — all of which help to develop ourselves internally, making us better archers but more importantly, better people. Personally, I credit archery with helping me to transform. I came to it after a difficult struggle and time period in my life, and archery has helped to ground me and give me principles that I do my best to carry with me throughout my day and life. I hope you’ll join us for archery and see how it can help you and experience for yourself how fun and rewarding it is to learn and practice.